Over the years R/C crawlers have become more realistic in terms of performance and scale features. But to date, the crawler hobby industry hasn't seen a high performance “daily driver” – what we industry junkies describe as a 1:1 vehicle that can be purchased from the dealership, a truck without a suspension lift and big tires. So we set out to produce this truck - a performance based “daily driver” packed with innovations; fine enough to be a shelf queen and badass enough to be a beast on the trails! HOW IS THE BRX01 DIFFERENT? Starting with a clean sheet of paper the 1/10 BRX01 was developed as a performance based R/C crawler chassis with a scale "stock truck" appearance. 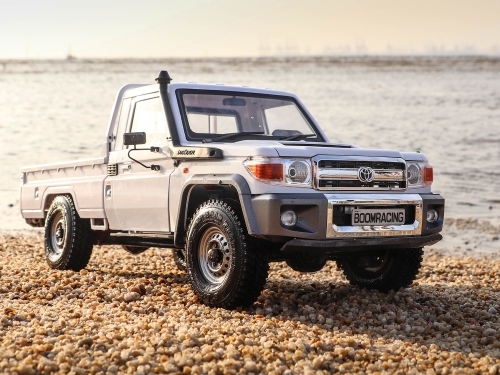 It combines many performance and scale features into a single ground breaking vehicle. What makes the BRX01 special is that many of the features on the chassis come from the imaginations of fellow R/C hobbyists. By listening to their ideas and feedback, we are able to include many new and exciting features into the BRX01. *FREE Front Bumper Skid Plate & Two Red Rubber Traffic Cones* when you pre-order before 12am 1/1/2019 PST. A Bolt-On Kit means parts of the chassis is pre-assembled and requires minor assembly for completion. The factory assembled parts offer convenience for builders eager to get started. The BRX01 kit includes factory pre-built axles, transmission, transfer case and shocks. Shocks require oil to be filled (included). Owning a BRX01 is a truly unique and special experience. All BRX01 chassis kits include a BRX01 Owners Card. As the original owner, you are eligible to receive a special promotion at each of the events being attended by Boom Racing. Follow the instructions on the back of the Owners Card to register your vehicle. Once your vehicle is registered online, the chassis is officially registered to you and no one else can claim it. This will help with any future updates and can be used to notify you of new options in the future. All BRX01 chassis kits are numbered and include a VIN#. The Car No. and VIN# match those on the BRX01 Owners Card. No two chassis will ever be the same.